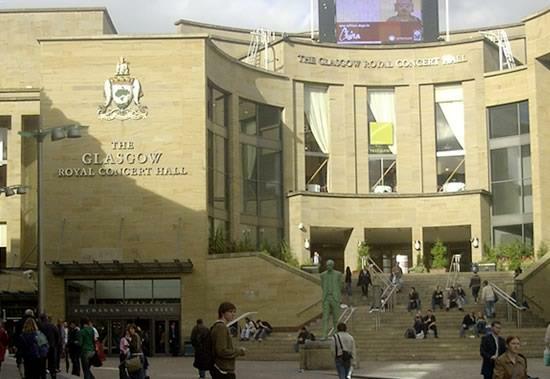 Completed in 1990 when Glasgow was awarded European City of Culture, The Glasgow Royal Concert Hall is internationally renowned and stages a plethora of stage productions, concerts and celebrity guest appearances. Architect, Sir Leslie Martin designed the Concert Hall and was completed in a mere 864 days from when the first stone was laid in the late 1980s. Shortly after its construction in 1990, the venue was granted Royal status by HRH The Princess Royal. The Concert Hall is colossal in size and is a dominant landmark in Glasgow's cityscape. The two main hi-tech auditoria can accommodate 2500, and has seating tiers that can be manoeuvred hydraulically to suit whatever layout is required. In addition, the auditorium area is insulated by a massive rubber membrane built into the floor - intended to dampen out noise and vibration from the rail tracks that lie underneath. The Glasgow Royal Concert Hall has staged some of the world's greatest orchestras, including The St. Petersburg Philharmonic, The Moscow State Orchestra and The Vienna Philharmonic Orchestra, all playing to a sell out audience. Scottish Classical Music is well represented at the Royal Concert Hall and in 1993, all four Scottish Orchestras played together for the first time; the RSNO, BBC Scottish Symphony Orchestra, Scottish Opera Orchestra and Scottish Chamber Orchestra. Some of the World's important political events have taken place in the Glasgow Royal Concert Hall. Nelson Mandela nominated Glasgow and The Royal Concert Hall for formally receiving the freedoms out of eight other British cities.